Today’s post is sponsored by Roja Wine! It feels so crazy to me that the holiday season is here! Wasn’t it just summer??!! We just had our coldest day yet yesterday and it even felt like snow was in the air. I hate the cold, but I love the snow :). I also can start to feel the energy of Christmas and the holidays in the air somehow. Decorations are up in the stores and invitations for Christmas parties are out. I don’t know about you, but for me and Debbie part of this time of the year includes stocking up our liquor cabinets and especially our wine racks in anticipation of guests and festivities. 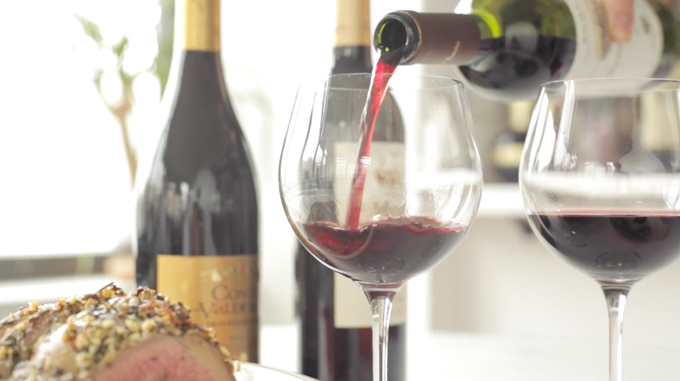 When we were asked by Honest Cooking and Rioja wines to prepare a post about their wines we jumped at the chance since neither of us had tried them before and we just love trying new wines and broadening our knowledge of these kinds of things. Turns out, Rioja wines are very very good! I am not a red wine drinker, I prefer white, but I drank this wine all night. Debbie is a red wine drinker and she loved it as well. 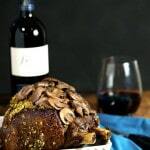 We made this Ribeye Roast at my place and Mark and Kevin came later and we had dinner and sipped on these wines all evening. We got three different kinds of wine to try and so far our favorite is the Beronia Reserva 2010. Its smooth with deep flavors of black fruits, chocolate and cloves, but light at the same time. Delicious! 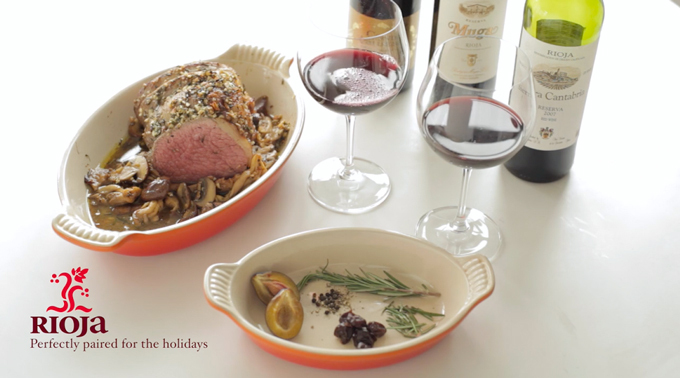 This roast recipe is not our own, we were given this recipe by Rioja wines as meal to pair with the wine. So naturally we had to make it as well and we highly recommend it. Simple, but amazing! So flavorful and very tender. 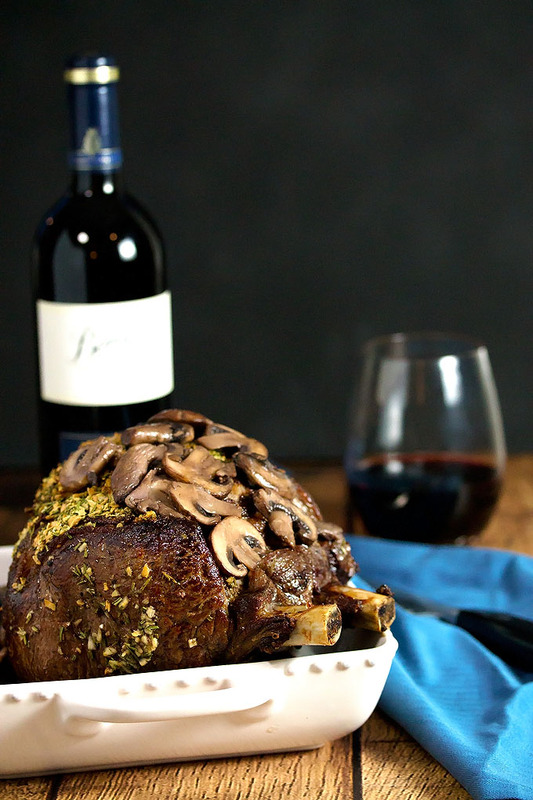 We changed up our roast slightly as we bought a bone in ribeye roast and we added some Rioja wine to the gravy, but either way you make it, it should definitely get on your table along with a few bottles or so of this gorgeous wine! The holiday season is in full swing. Before you know it your kitchen will be pumping out glorious platters of food and your dining room will be bustling with friends and family from near and far. But let’s not forget the drinks! 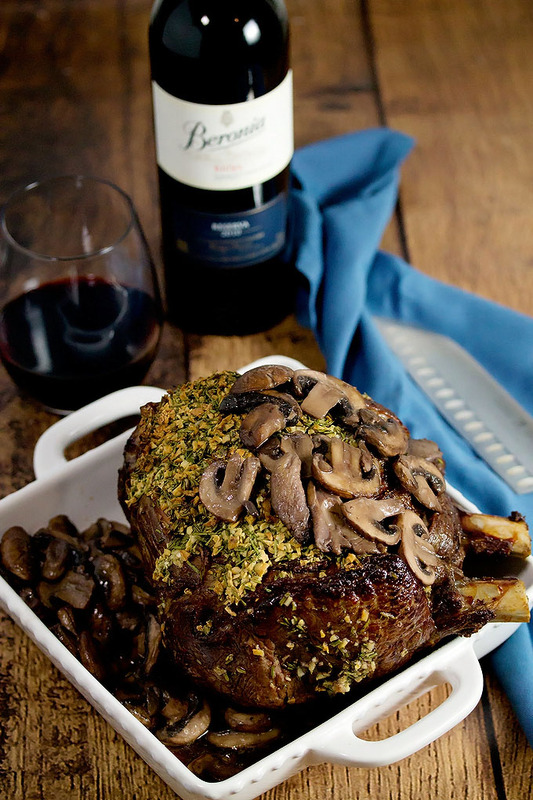 To celebrate the holidays make this mouthwatering beef roast perfect with Rioja Reserva wines. Rioja’s Reserva and Gran Reserva wines are made from the best vintages and are aged in the bottles by the winemakers before release so you don’t have to. Aged at least three years, and usually longer, before release, these wines have refined character. 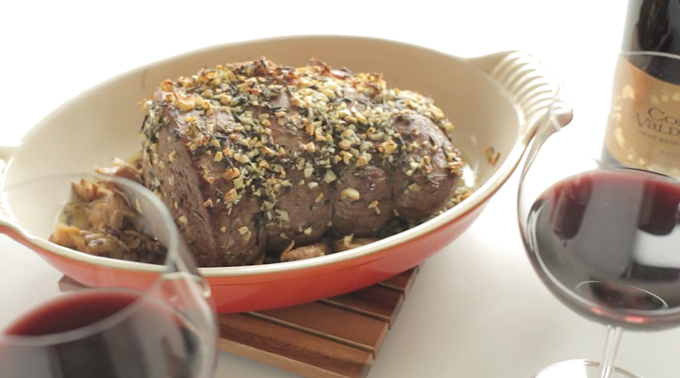 Wow your dinner guests with this aromatic rosemary and garlic roast that is so simple to make and complete with a beautiful presentation paired with Rioja Reserva wines. 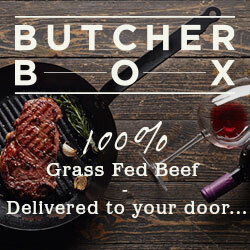 Season meat with salt and pepper and then mix together rosemary and garlic. Set it aside. Heat up a skillet with cooking oil and sear all side of the meat. 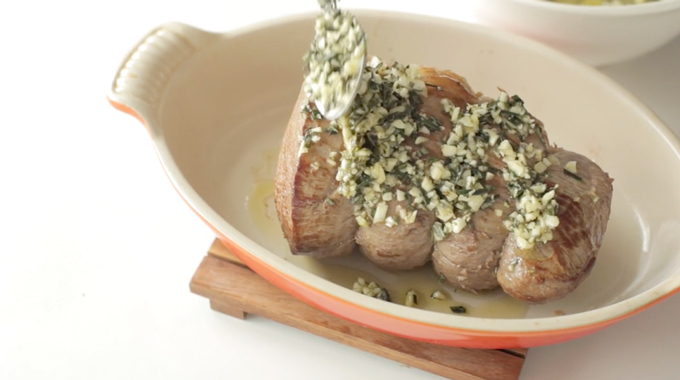 Remove the roast from the pan and coat the meat with the herb-garlic mixture. In a medium pan, saute the mushrooms with butter until cooked through and then season with salt and pepper. Remove the meat from the skillet it was cooked in and bring the pan to the stovetop. Add stock to the pan and deglaze it, being sure to scrape the bits on the bottom. Allow to simmer until thick. Debbie and I added a little Rioja wine to our mushroom sauce and it was DIVINE. Also if you like your gravy to be a little thicker, make a slurry with 1/2 tsp cornstarch and a little stock then add to the sauce. I can pretty much guarantee that visions of this beef are going to be dancing in my head all day.